I’m gonna take that infamous Forrest Gump quote and tweak it and turn it on its head: life is NOT like a gumball machine. I cannot just put something in (money, effort, etc.) and expect a specific outcome. Over two weeks ago, I wrote and posted Unintended and Unwelcome Interruption, about why I’d not been writing or even commenting much in the blogosphere. Namely, I was struggling with computer issues and some urinary distress not to be blown off as a mere UTI. By then, those issues had been going on for a few weeks. And they did not end with that post. So yes, I’ve still been spotty about posting and reading new posts by my favorite bloggers—well, I can read them sometimes, but only able to “like” or comment at random moments according to activity and what machine was working at the moment. The fall-out from the past two months is some unpleasant understandings. I’m not saying cancer was easy for me, but I knew, and realized all over again, I was lucky in that things went according to plan. The oncology team suggested, and we all agreed, let’s do chemo to shrink the tumor, then remove what it left (lucky lumpectomy! ), then do radiation. Except for a few hiccups, as in a misdiagnosed Staph that delayed radiation, all went according to the plan, the timeline. Yeah, it took over a year—thanks to being HER2+ and needing a year’s worth of Herceptin—but everyone input the required efforts and actions, and the expected outcome was achieved. Again, I know that does NOT describe the cancer experiences of too many other patients, so yeah, I was lucky. That does NOT describe my recent weeks. No, I’ve fought and fussed with multiple trips to multiple computer repair services. A postponed appointment from the urologist before I even met him caused me to have an utter meltdown. I pride myself in applying processes of elimination and deduction to figure out solutions to problems. I do ABC and expect XYZ—and that just….never happened over the course of the past few weeks. If I were to play a film of myself and my recent behavior, I imagine it would look like someone running full steam into every surrounding wall and getting destroyed. I’ve always known I have some issues with chaos and control, and have long planned to write about them, especially since cancer and control (or lack of) have left scars on my mind. My friend, who deals with chronic illness, and I joke about rearranging the sock drawer. 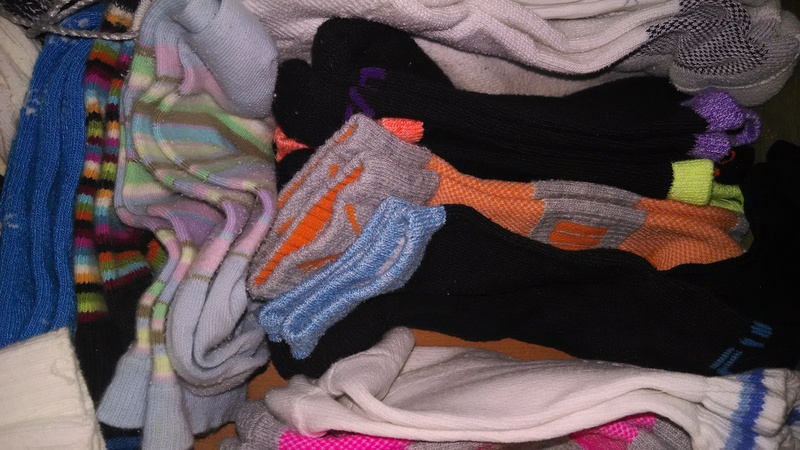 When life events go awry and we know we cannot do anything about the events, we reorganize something, like the drawer of socks or other clothing. I like socks. I will group them all by when I wear them seasonally. The next time I feel out of control, I go and group them according to color and/or type. You get the idea. My life will be falling apart, but I can make the socks behave. I think I’ve turned a corner, my issues seem on the road to being resolved. But, hey, I thought resolution was nearby two weeks ago with that previous post, and look what happened. I chastise myself to not count the chickens before they hatch. Still waiting to pick up one laptop, still waiting for medications and a test that could confirm what the urologists thinks is wrong—and I hope it is as simple as he thinks—as in NOT cancer. But I am breathing a little easier. And I’ll leave the drawer full of socks alone today. Next Next post: You. Are. Scaring. Me.